Edinburgh has been on my Scottish Bucket List for a long time. 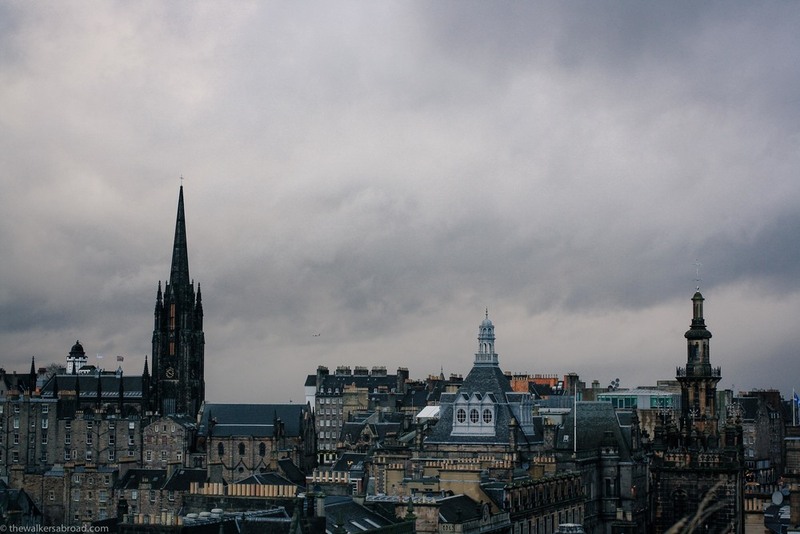 Not only is there so much history in the Scottish capital, but the architecture and scenic landscapes are breathtaking. Fortunately, we met up with a friend who was our impeccable tour guide and we were able to walk all around the city, seeing most of the incredible (and free) sights. 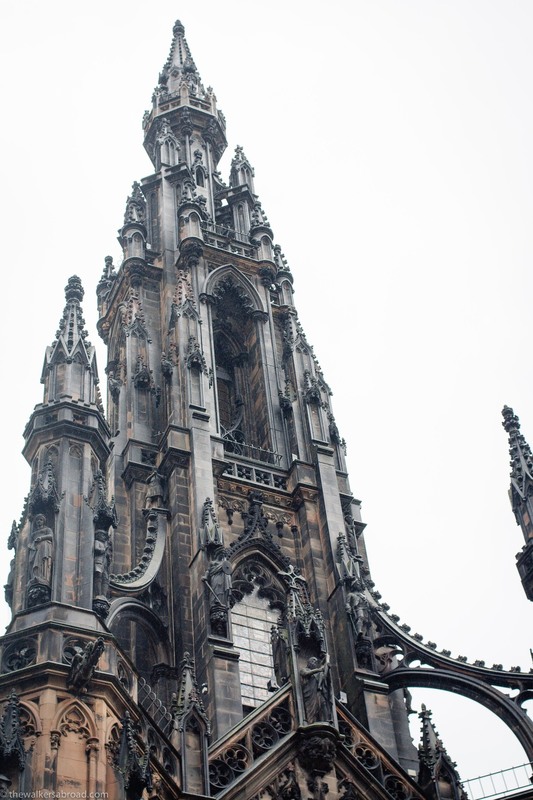 The Sir Walter Scott Memorial. It was closed when we first walked by and later on the view wasn't that great so we decided we'll just have to return to explore it a bit more. We arrived in Edinburgh by train early in the morning. The weather was Scottish: cold, windy, and very wet. Nothing much was open so we popped into the department store, Jenners and wandered around waiting for the National Gallery to open. The great thing about British museums and galleries is that they are free. (I keep saying this over and over again but it's incredible to my American mind!) The National Galleries of Scotland was stunning and absolutely blew me away. We saw Rembrandt, Reubens, Monet, Van Gough, Gaugin, Tintoretto, Da Vinci (our first time seeing one of his paintings! ), and many more. Next time, I'll visit the modern section too! After wandering around the galleries, we decided to head up to the touristy Royal Mile. At one end of the mile is Holyrood Palace, where Queen Elizabeth stays when she is in Edinburgh. At the other end is the imposing Edinburgh Castle which looks over the city. Edinburgh Castle is the walled building on the right center. We headed up the hill towards Edinburgh castle, saving Holyrood for another trip. On the way up to the castle, we stopped at St. Giles' Cathedral. St. Giles' Cathedral truly deserves its own post, because there was so much to take in at this stunning cathedral. Admission is free, but if you want to take pictures, there is a £2 fee. If you enjoy church history, this building is full of it. The staff are attentive and knowledgeable and very willing to answer any questions you may have. I was intently looking at a large document in a darkened corner of the Cathedral when a friendly staff member came over and informed me that I was looking at an original, signed National Covenant from 1638 . He was able to give a bit of history about the document and used his flashlight to illuminate it so I could see the document better. Of course, seeing the document sent us into a it of historical digging about the Covenanters, but that's a a different story! Next, we walked up to Edinburgh Castle. Admission to get in is £16.50, unless you have a Historic Scotland membership. We're saving up for one, so we opted to return when we have the membership. The view from the front of the castle was incredible and the rain stopped so we had a great view of the city below. Looking towards Arthur's Seat, part of Holyrood Park and yet another part of Edinburgh we need to explore. 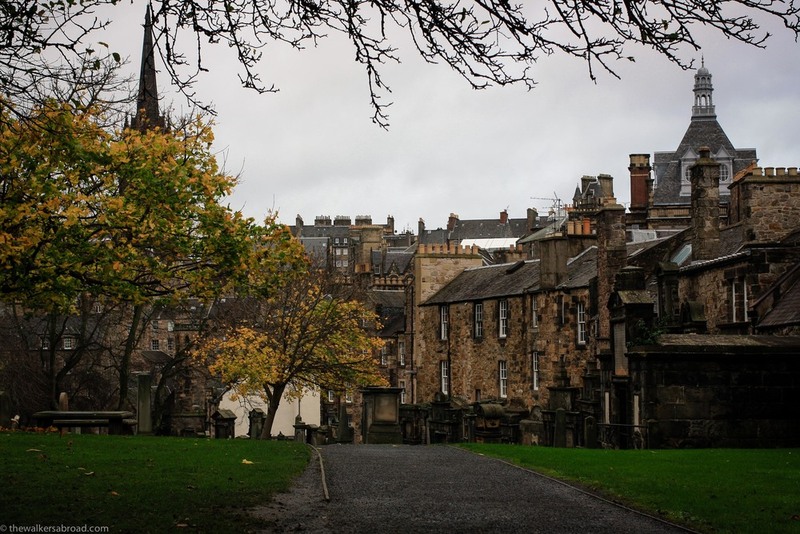 Walking back down the hill, we took a right onto George IV Bridge and meandered down the street towards Greyfriar's kirkyard. We stopped to see Greyfriar's Bobby, whose nose has been nearly rubbed away. We had two sites to see in the kirkyard. We found both memorials and emerged from the yard, only a bit muddy. Even with the mud, the kirkyard is hauntingly beautiful. Some of the stones have been erased through time, some of toppled over, but some still stand. At the upper hill, behind the church, is the covenanters' prison. The entrance gates were locked (because supposedly that area is haunted and the ghosts like to attack visitors), but there are tours that allow you to go into the prison area. Of course, the the most famous poltergeist in Scotland would be in this cemetery. Personally, I didn't notice anything creepy or weird, especially when we walked by the Covenanters' Prison or the grave of Sir George McKenzie (who supposedly is the ghost). Around 400 Covenanters' were imprisoned here during the winter months of 1679-80. A quick trip to the National Museum, just up the street, rounded out our visit to Edinburgh. We spent some time discussing Scottish religious history and then meandered up the stairs to the Roof Terrace where we saw some great views of the city in the gathering dusk. I had been so excited to see this city and it definitely did not disappoint. I'm already excited about a return trip so we can explore some more of the incredible history. My list of places to see in Edinburgh has probably doubled, but there is so much to see!